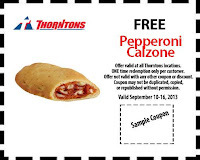 Hurry to your nearest Thorntons to receive a FREE Pepperoni Calzone! All you have to do is "like" Thontons on Facebook, click the Welcome Tab and print outthe coupon. You can also scan the coupon from your phone using the Thorntons Mobile App.